Once again, the spirits of Marcy the Medium have influenced my fabric selection! “You need more yellow in your life,” she stated. 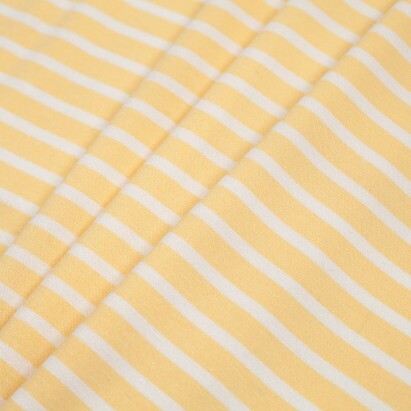 I think I ordered the best yellow a n y t h i n g ever available, for Mood Fabrics’ Theory Light Canary Striped Viscose Ponte Blend has more than surpassed my expectations! I wasn’t ready to put away the pattern from my last project (New Look 6210) quite yet – especially since the fit had been tweeked to perfection. Besides, I had set out to make a maxi and ended up with a short dress. The phenomenal drape of this fabric begged for a maxi and frankly, how could I resist? My only alteration was to add an inch of fabric to the front lower armsyce for better coverage. Since the fabric/pattern combination screams summer, I opted for the racer back rendition – a first for me. What took four days to make last week took four hours to make this week, due in part to this beautifully behaved viscose ponte knit. No slipping, no sliding, no curling and it is perfectly on grain.